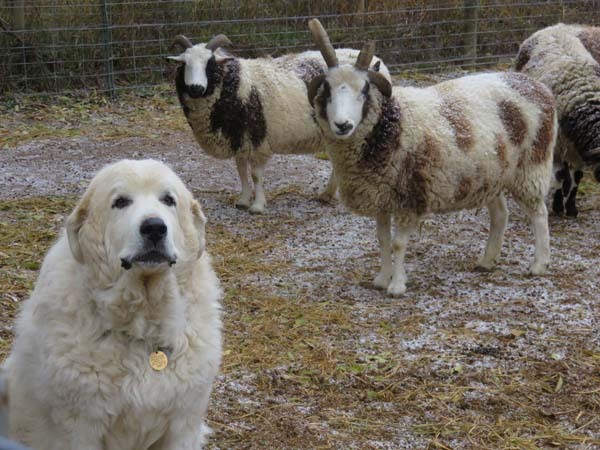 Little Chief, a Great Pyrenees, watches over Jacob sheep owned by Mickey Ramirez and John Pierson. It’s Christmas Eve 2014, and Little Chief, a Great Pyrenees, is watching over a flock of 15 Jacob sheep by day and night behind the home of Mickey Ramirez and her husband John Pierson. By the time the new year is well under way, the sheep will have eaten the needles off of at least one live Christmas tree. Mickey, who makes felted hats from the wool of her sheep, was featured in a post on November 19. Here are a few more photos you haven’t seen that date back to previous posts. This ceramic bowl by Chris Wolff was broken purposely, spray painted, and glued back together. 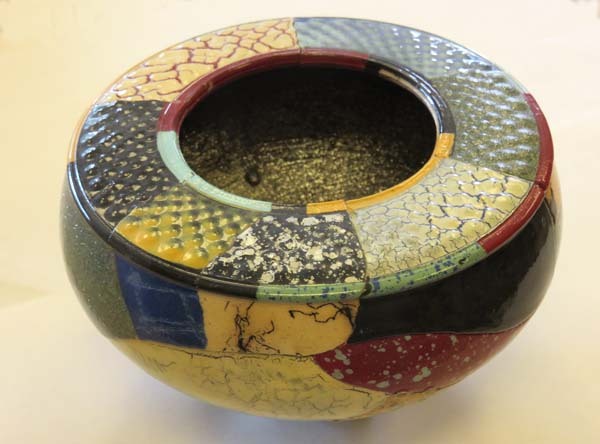 Chris Wolff discovered that he could carefully break a fired piece of pottery, spray paint the pieces, and glue them back together to create a totally new look in pottery. He covers the interior with a waterproof coating. Chris was featured in a post in August, the first month that “Handmade on the Front Range” appeared on the web. A ceramic bowl by T.S. Berger can be used every day for food preparation and serving. 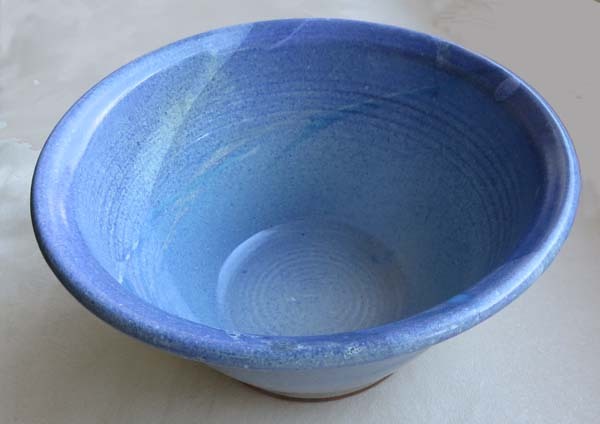 When I think about how a bowl like this spins on a wheel while the potter lets the clay pull up through his hands, I marvel at how even the sides are and how perfect the circle. T.S. Berger loaned me this bowl for photographing my scone-making earlier this month. Today you can see what the whole bowl looks like. 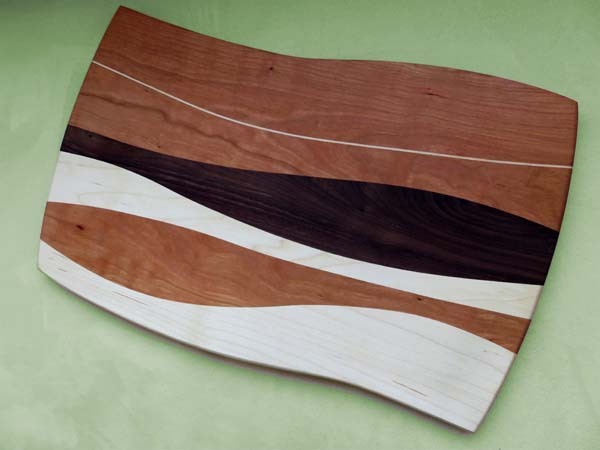 Mike Wilkinson of Fort Collins created this cutting board from cherry, walnut, and maple. Mike Wilkinson loaned me this cutting board for the same post in which I used the bowl by T.S. Berger. A goal of mine for 2015: finding out how you make curved pieces of wood fit together perfectly with a smooth finished surface. When I find out, I’ll share the answer with you. Neither Mike nor T.S. knew me before they loaned me their work. I’m always impressed by how artisans support each other in a business that could be fiercely competetive. In this case, I personally benefited from that spirit of cooperation. Thank you, Mike and T.S. 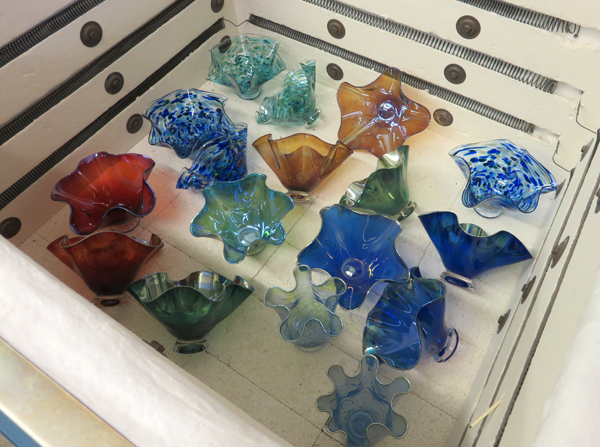 Glass bowls newly blown by Dottie Boscamp cool gradually in a kiln. Dottie Boscamp reduced the oxygen flow to her furnace (called a glory hole) while she was making the solid-colored glass bowls above. The increased concentration of carbon dioxide caused the silvery edges — although they look as if they have been touched with sterling silver. Dottie’s work appeared in a post in September. 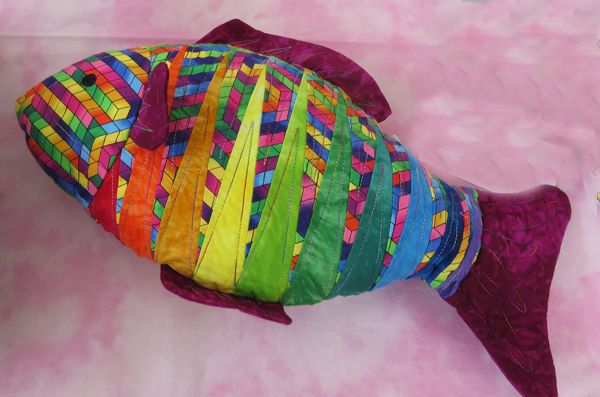 Pat Abbitt of Broomfield, Colorado, created this stuffed fish using quilting techniques. Pat Abbitt’s use of color adds immeasurably to the quilted stuffed animals that she offers under the name Its A Zoo. I’ve enjoyed seeing some of her latest creations by following Its A Zoo on Facebook. Its A Zoo was featured in a post on September 24. 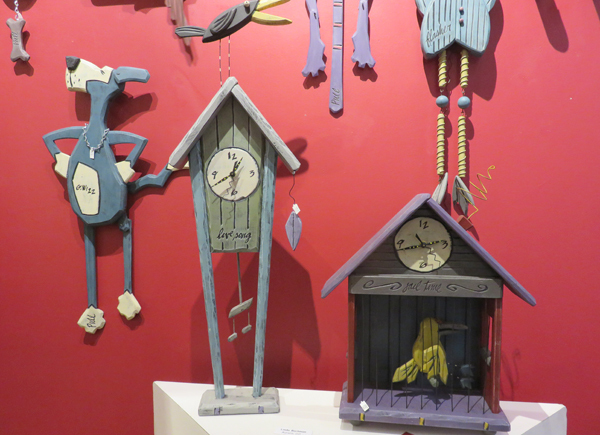 Show of Hands, Denver, offers the humorous work of Front Range artisans Laura and Rick Bachman. Laura and Rick Bachman use animals and color to elicit smiles too, often using barnyard humor. Show of Hands in Denver (featured on November 12) had several of their clocks and pullies on display when I was there. 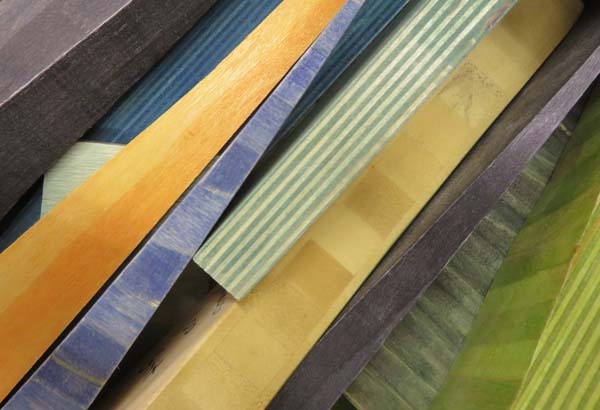 Anne Bossert keeps a supply of wood scraps for color samples her customers may choose from. If the holiday season has kept you too busy to read every post, you’ll have a chance to catch up next week. I’ll provide you with a summary of and links to all the blog’s posts in 2014. This entry was posted in Other and tagged Anne Bossert, Chris Wolff, Dottie Boscamp, Mickey Ramirez, Mike Wilkinson, Pat Abbitt, T.S. Berger on December 24, 2014 by Sally. Really enjoy your weekly blogs. Hope I can travel with you sometime. Thanks, Sue. Merry Christmas to you too.